^ Saha, Gopal. Fundamentals of Nuclear Pharmacy Sixth. Springer Science+Business Media. 2010: 11 [2011-04-02]. ISBN 1-4419-5859-2. ^ Frequently Asked Questions #1. Radiation Effects Research Foundation. [September 18, 2007]. （原始内容存档于2007年9月19日）. ^ 車諾比核災、福島核災與原子彈爆炸相同嗎?. 經濟部論壇. 經濟部. [2015-03-25]. （原始内容存档于2015-03-19）. ^ E. Rutherford. The scattering of α and β particles by matter and the structure of the atom (PDF). Philosophical Magazine. 1911, 21 (4): 669–688. Bibcode:2012PMag...92..379R. doi:10.1080/14786435.2011.617037. ^ Cockcroft and Walton split lithium with high energy protons April 1932. Outreach.phy.cam.ac.uk. 1932-04-14 [2013-01-04]. （原始内容存档于2012-09-02）. ^ Sir Mark Oliphant (1901–2000) (PDF). University of Adelaide. [5 October 2013]. （原始内容 (PDF)存档于2013年10月5日）. ^ Chadwick announced his initial findings in: J. Chadwick. Possible Existence of a Neutron (PDF). Nature. 1932, 129 (3252): 312. Bibcode:1932Natur.129Q.312C. doi:10.1038/129312a0. Subsequently he communicated his findings in more detail in: Chadwick, J. The existence of a neutron. Proceedings of the Royal Society A. 1932, 136 (830): 692–708. Bibcode:1932RSPSA.136..692C. doi:10.1098/rspa.1932.0112. ; and Chadwick, J. The Bakerian Lecture: The neutron. Proceedings of the Royal Society A. 1933, 142 (846): 1–25. Bibcode:1933RSPSA.142....1C. doi:10.1098/rspa.1933.0152. ^ O. Hahn and F. Strassmann. Über den Nachweis und das Verhalten der bei der Bestrahlung des Urans mittels Neutronen entstehenden Erdalkalimetalle ("On the detection and characteristics of the alkaline earth metals formed by irradiation of uranium with neutrons"). Naturwissenschaften. 1939, 27 (1): 11–15. Bibcode:1939NW.....27...11H. doi:10.1007/BF01488241. . The authors were identified as being at the Kaiser-Wilhelm-Institut für Chemie, Berlin-Dahlem. Received 22 December 1938. ^ L. Meitner and O. R. Frisch. 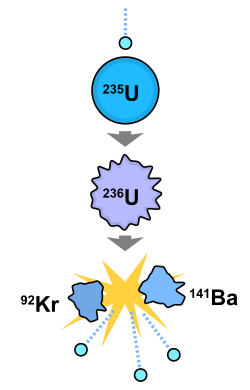 Disintegration of Uranium by Neutrons: a New Type of Nuclear Reaction. Nature. 1939, 143 (3615): 239. Bibcode:1939Natur.143..239M. doi:10.1038/143239a0. . The paper is dated 16 January 1939. Meitner is identified as being at the Physical Institute, Academy of Sciences, Stockholm. Frisch is identified as being at the Institute of Theoretical Physics, University of Copenhagen. ^ O. R. Frisch. Physical Evidence for the Division of Heavy Nuclei under Neutron Bombardment. Nature. 1939, 143 (3616): 276. Bibcode:1939Natur.143..276F. doi:10.1038/143276a0. （原始内容存档于2009-01-23）. ^ Physical Evidence for the Division of Heavy Nuclei under Neutron Bombardment. 17 January 1939. （原始内容存档于2008-01-08）. 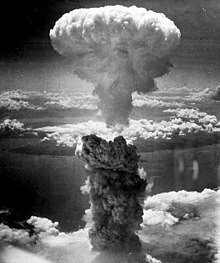 The experiment for this letter to the editor was conducted on 13 January 1939; see Richard Rhodes (1986) The Making of the Atomic Bomb, Simon and Schuster. pp. 263 and 268, ISBN 978-0-671-44133-3. ^ The Nobel Prize in Chemistry 1944. Nobelprize.org. [2008-10-06]. DOE Fundamentals Handbook: Nuclear Physics and Reactor Theory Volume 1 (PDF). U.S. Department of Energy. January 1993 [2012-01-03]. （原始内容 (PDF)存档于2014-03-19）. DOE Fundamentals Handbook: Nuclear Physics and Reactor Theory Volume 2 (PDF). U.S. Department of Energy. January 1993 [2012-01-03]. （原始内容 (PDF)存档于2013-12-03）.